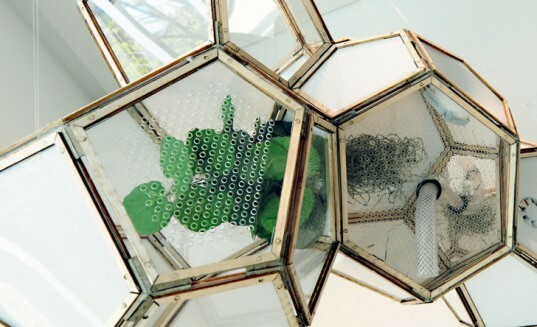 The Filtration Block is an air purifying system that uses plants to absorb indoor toxins. Designer Elaine Tong created the project as a versatile modular unit that can be mounted on a wall or hung from the ceiling. Manufactured by the University of Toronto’s RAD (Responsive Architecture at Daniels), the blocks help tackle the emerging challenges of air pollution in urban dwellings. Simultaneously taking in and releasing air, the Filtration Block acts as a living, breathing organism that nurtures your health. The structure is based on Weaire Phelan geometry (3-dimesional structure of equal-sized bubbles). The modules lock together and form flexible compositions. Each module contains plants with roots that are highly efficient in absorbing indoor air toxins such as formaldehyde and benzene. Providing optimal light exposure, they function as micro-greenhouses connected by water misting infrastructure that distributes water through the use of humidity sensors and atomizers. The absorption of polluted air is supported by fans attached to alternating modules. The structure is based on Weaire Phelan geometry (3-dimesional structure of equal-sized bubbles). The modules lock together and form flexible compositions. Each module contains plants with roots that are highly efficient in absorbing indoor air toxins such as formaldehyde and benzene. Providing optimal light exposure, they function as micro-greenhouses connected by water misting infrastructure that distributes water through the use of humidity sensors and atomizers. 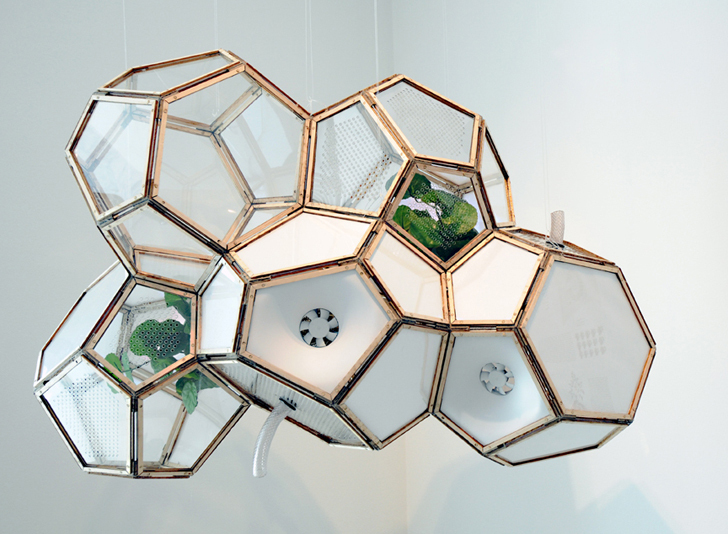 The absorption of polluted air is supported by fans attached to alternating modules.